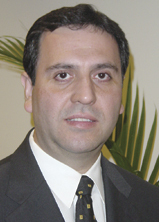 Marcos Morales was born into a missionary home in Mendoza, Argentina. Growing up surrounded by an active ministry was a great blessing for him, which continues to this day. At the age of nine, Marcos received the Lord Yeshua the Messiah as his personal Savior. Marcos’ father, always a studious man of biblical prophecies, has a heart for Israel as well and impressed these teachings on Marcos during his teen years. As Marcos was approaching his eighteenth birthday, he felt the Lord’s call to bring the Good News of salvation to the Jew first. Since that time, the Lord has brought many Jewish people into his path. In college, Marcos had the opportunity to share the Gospel with many Jewish classmates who looked to him for friendship—and some of them wanted to know more about the Messiah. This experience led Marcos to deepen his understanding of Jewish culture, customs, and terminology, which helped him to present the Gospel in a more accurate way. Shortly afterward, he began to study biblical Hebrew and met Deborah (who would become his wife). Of a conservative Jewish family, Deborah came to faith in Messiah when she was a teenager while attending a summer Bible camp. The Lord later called her to serve Him among His Chosen People. In 1993, Marcos and Deborah married; and the Lord has blessed them with two daughters, Johanna and Sol. Currently, the Moraleses are serving the Lord among the Jewish people in Mendoza—the most important city in Argentina's western area—by holding weekly meetings, Bible studies, discipleships, and radio programs. Marcos has been invited to speak to several regional conferences, and participates in a monthly prayer meeting with pastors and elders in Mendoza. Of the nearly 800,000 Jewish souls in Latin America, 400,000 of these live in Argentina. God has placed in the hearts of Marcos and Deborah the vision and desire to reach them all with the precious message of salvation.